The official history of Earth has a new chapter - and we are in it. It should be said, however, there is disquiet in the scientific community at the way the change has been introduced. Some researchers feel there has been insufficient discussion on the matter since the Meghalayan was first raised as an idea in a scholarly paper seven years ago. 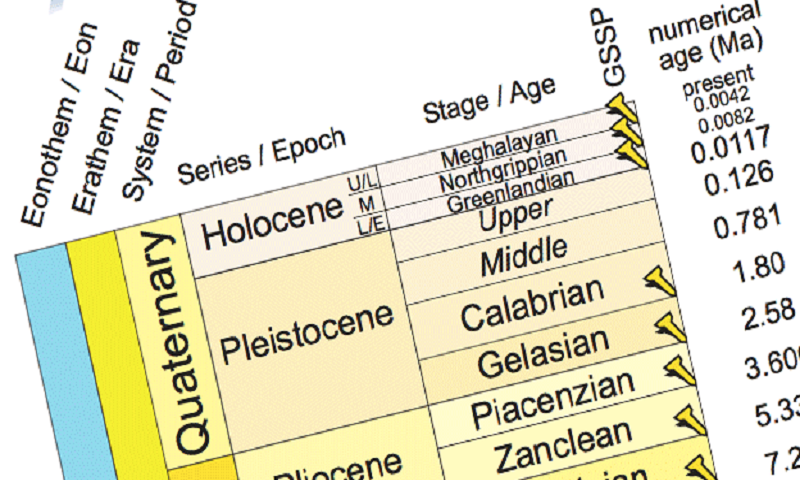 Geologists divide up the 4.6-billion-year existence of Earth into slices of time. Each slice corresponds to significant happenings - such as the break-up of continents, dramatic shifts in climate, and even the emergence of particular types of animals and plant life. We currently live in what is called the Holocene Epoch, which reflects everything that has happened over the past 11,700 years - since a dramatic warming kicked us out of the last ice age. But the Holocene itself can be subdivided, according to the International Commission on Stratigraphy (ICS). It is the official keeper of geologic time and it proposed three stages be introduced to denote the epoch's upper, middle and lower phases. These all record major climate events. The Meghalayan, the youngest stage, runs from 4,200 years ago to 1950. It began with a destructive drought, whose effects lasted two centuries, and severely disrupted civilisations in Egypt, Greece, Syria, Palestine, Mesopotamia, the Indus Valley, and the Yangtze River Valley. It was likely triggered by shifts in ocean and atmospheric circulation. The oldest phase of the Holocene - the exit from the ice age - will be known as the Greenlandian. To win a classification, a slice of geological time generally has to reflect something whose effects were were global in extent, and be associated with a rock or sediment type that is clear and unambiguous. Already the decision to discriminate ages within the Holocene has drawn fire from some scientists who believe the move is premature. They question whether some of the climate shifts used as anchors for the new ages were truly global in their impact. Tentatively referred to as the Anthropocene, its precise definition - its beginning point and the spike used to denote its initiation - is the subject of ongoing research. He told BBC News: "After the original paper and going through various committees, they've suddenly announced [the Meghalayan] and stuck it on the diagram. It's official, we're in a new age; who knew? We have lots of new definitions that perhaps now contradict the Anthropocene Working Group and go against what most scientists perceive to be the most important change on Earth in the last 10,000 years."